You may already know what Columbus did in 1492, but did you know that Columbus Day didn’t become a holiday until 1937? Even if you’re not into history, you’ll be happy to know that this relatively new national holiday means big savings for you this weekend! What did I tell you? You’ll find incredible savings in every department at Macy’s and on Macys.com right now, all you have to do is let your fingers start scrolling and clicking from the comfort of your home! How to Save: Place qualifying items in shopping bag, then enter promo code SAVE in the box labeled “HAVE A PROMO CODE?” and click “APPLY.” You can enter the promo code in your shopping bag at any time before or during checkout. * EXTRA 20% OFF select sale & clearance-priced clothing, home items, jewelry & accessories. * EXTRA 15% OFF select sale & clearance-priced coats, suits, dresses, women’s swim & lingerie. * EXTRA 10% OFF select sale & clearance-priced watches, small appliances & lighting. Keep in mind, there are exclusions and the Columbus Day Sale promo code cannot be combined with any savings pass/coupon, extra discount or credit offer except opening a new Macy’s account. 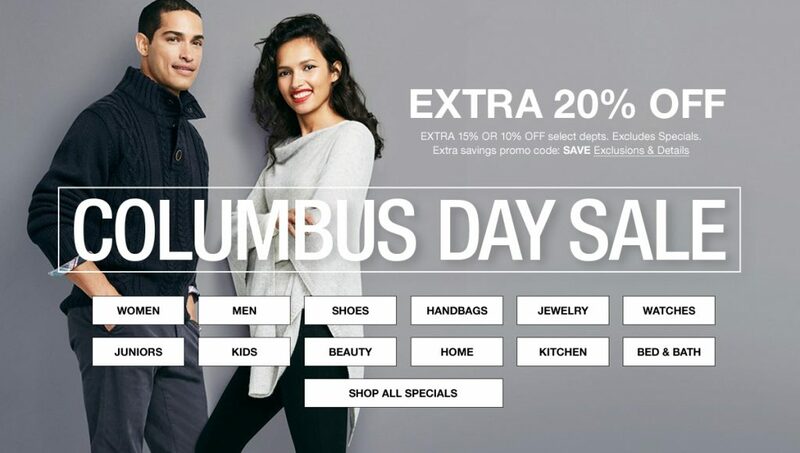 Wondering if there are special store hours for your local Macy’s during the Columbus Day Sale? You can check holiday store hours here.